But it’s worth noting that we’re now in at least year five of this self-proclaimed howliday, so it must be true. That and the fact that I and my two compadres Ranger and Dui have the same barkday this month make Scottish Terrier Month a commemoration that must be valid. Yes? Yes. 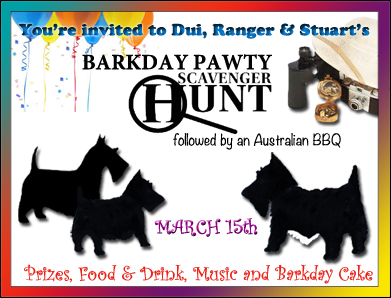 To help make Scottish Terrier Month even MORE fun, please join us for our barkday pawty. It’s on the Ides of March so get out your best Julius Caesar costume and get ready. Just kidding about Julius Caesar. Maybe that’ll be our theme next year and all the gals can come as Elizabeth Taylor playing Cleopatra. Wasn’t she bee-you-ti-ful???? That means I can dress like Richard Burton. Boy. Can I get sidetracked or what???? That’s the Pisces in me. Just like a fish swimming in all sorts of directions. Just can’t make up my mind. Speaking of swimming, it’s time for a beach picture. Yippeeeeee! One of my favorite things! The beach! HINT- Don’t forget – you need to familiarize yourself with The Scottie Chronicles because my Scavenger Hunt clues for the barkday pawty are gonna be all over the place. 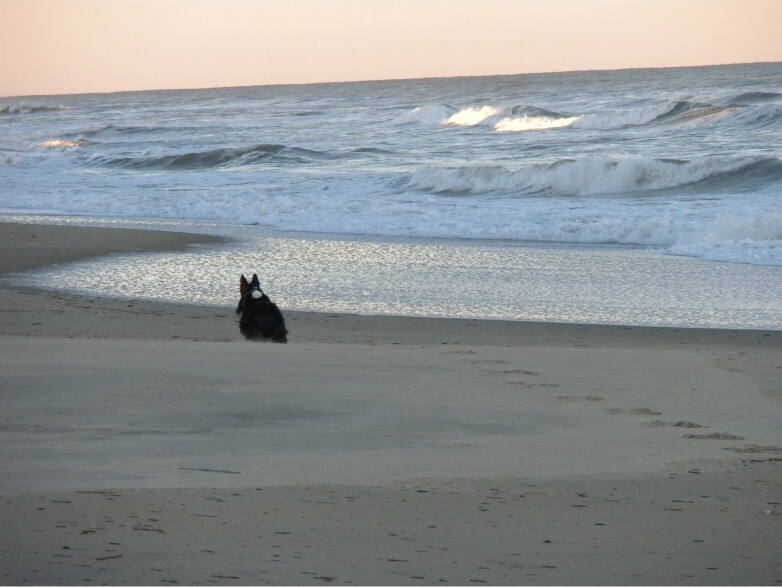 This entry was posted in The Scottie Chronicles and tagged astrology, birthday parties, Cleopatra, Julius Caesar, Pisces, Scotties, Scottish Terrier Month, the Ides of March. Bookmark the permalink. Why didn’t I think of that???? Scottie month? Oh what a fabulous idea! Kyla said I’m a honorary scottie, so I can ask my staff for a gift, right? right. Why are you saying we just have a month. Why everyday is Scottie Day. Only ONE Scotty month !!!!! Well, we better make the most of March then…Scotty parades…green bean cook offs…nap contests…and car rides…long walkies….AroOo ♪ singing groups judging with cookies for all. Sure glad Feb wasn’t Scotty month, that one is way to short !!!! Whoo Hoo for Scotty Month…… You have a great peep Mr. Stuart to think of such a thing !! Scottie parades? I think one is in order soon, don’t you? Will you wear a crown of bay leaves on your head? If you want. I’ll try but my head is pretty small. Yea, yea! Scottie Month for March is a super idea, Stuart! We also have St. Patrick’s Day, the first day of Spring and turning the clocks ahead! OH me….Sunday, when we spring forward, I’ll be waking up in the dark. I hate that. Well, I designate every month Westie Month. Top dat. Shelby and Sid agree with March being Scottish Terrier Month. They were both born in March. We don’t have beaches like that in Nebraska, so we are a bit jealous. It looks like much fun and you are lucky!!!! Dat’s a grrrrrrrrreat idea for next years pawty! I love it. Yep…this is definitely Scottie month….Stuart thanks for coming by and wish me a happy gotcha day….you made it a great day…yep SCOTTIE MONTH . SCOTTIE MONTH???!! Holy Scottish Whisky!!!! Why isn’t there an AIREDALE MONTH???? Shoot…I gots to work on that one! Hey, I gots the margarita truck all stocked with the finest Scottish Whisky and Ales and some Irn Bru for those wee lads and lassies!